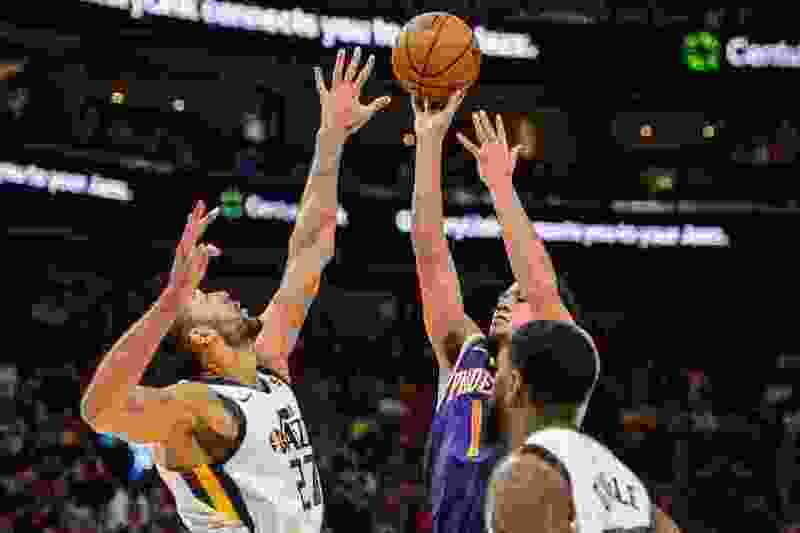 (Trent Nelson | The Salt Lake Tribune) Phoenix Suns guard Devin Booker (1) shoots over Utah Jazz center Rudy Gobert (27) as the Utah Jazz host the Phoenix Suns, NBA basketball in Salt Lake City on Monday March 25, 2019. Three thoughts on the Utah Jazz’s 125-92 win over the Phoenix Suns from Salt Lake Tribune beat writer Andy Larsen. It’s funny: the Jazz beat the Phoenix Suns by 33 points tonight, and all of the headlines will be about two players from the losing team. Is that wrong? I don’t know. 59 points is a legitimately special accomplishment, and while the last few points came in a very forced manner, what Devin Booker did tonight was unique. Scoring 59 on 19-34 shooting, going 5-8 from deep, and getting to the line that many times? Even as the Jazz focused and tried so many things to stop Booker, and only Booker, he still got those points. There will be those who use this game against him; as “proof” that while he can score, he’s not a winning player. That’s not what I saw tonight. I saw a team with exactly one good player, a team that was utterly helpless if Booker didn’t have the ball in his hands. Was he great defensively? No, but he wasn’t his team’s biggest problem at all. From a Jazz point of view, I thought it was an interesting problem, because there’s a pretty high possibility that they end up playing a team with an elite scoring guard, one that can score like Booker. Now, Damian Lillard, James Harden and Steph Curry and so on and so forth are different players than Booker, but they’re still very-talented, multi-dimensional guys. And the Jazz had problems with Booker. At first, Joe Ingles made the mistake of going under the pick and roll on his first couple of threes, which led to Booker getting an easy start to his night. Then, of course, the Jazz went over screens, but Booker found success with being able to get the defender on his back, then score in the midrange. So the Jazz trapped him later, and, worryingly, that didn’t work great either. Booker either split the trap, or got around the Jazz defenders, or even just drew a foul to take advantage of the aggression. It eventually forced a couple of turnovers, but the look took too long to get going. That’s not to say that the Jazz are hopeless against these kinds of guards. They absolutely shut down Bradley Beal, thanks to some excellent defense to Ingles and Royce O’Neale. This game, though will provide them with a little more tape to watch. Ricky Rubio had a very nice night tonight, scoring 18 points on only nine shots, finishing second on the Jazz in scoring behind Rudy Gobert. He also provided some nice passing, too, getting six assists compared to only two turnovers on the night. After a dismal start to the month, Rubio has turned it around in the last five games. In each, he’s shot over 50 percent or more from the field. In the last four, he’s scored 12 or more, too. What’s changed? To me, he’s attacking the paint more, rather than settling for his often-off-target jump shot. And while he’s certainly not the best player in the league at finishing around the rim, he’s still shooting 58 percent within 3 feet of the basket for the season, rather than the 30-40 percent he shoots in the mid-range and out. That 58 percent mark is a career high for Rubio, and shows how much he’s worked on improving that part of his game. Finishes like these are legitimately impressive. I do have the concern that this is the upside of playing bad teams. Let’s say there’s a rim protector down low instead of Dragan Bender there. Does that rim protector swat the Rubio layup to the 8th row? I think there’s a real likelihood of that. But regardless, the stats show real improvement over where he was before. Rubio told us after the game that the biggest difference, in his view, was that he wasn’t feeling healthy earlier in the month, so he was physically incapable of making these kinds of plays. That makes sense, based on what we saw. If the Jazz can get a more effective Rubio, they’re obviously a much harder team to face. I don’t have any reason to want Jimmer Fredette to fail. He seems like a nice enough kid, had some really cool moments at BYU, and continues to chase his dream even as he turned 30 last month. That’s all good. But let’s start here: Jazz play-by-play man David Locke said it’s “abundantly clear” that Fredette doesn’t belong in the NBA. I have to agree. As you’d expect, the offense is closer to NBA-level, and I’m saying that after a night in which he went 1-10 from the field and had two turnovers. He can clearly shoot shots, and even had an up-and-under move which sort of worked before he badly missed the layup. But oh man, the defense. The lengths that the Suns had to go to to try to hide him defensively were kind of crazy. First, they started him defending Raul Neto, who theoretically should be among his easier matchups among NBA point guards. But Neto blew right by Fredette for an and-one layup. I read so many arguments this year online between fans about who was better between Neto and Fredette, and those arguments were and are remarkably silly. So then they put Fredette on Thabo Sefolosha, but then the Jazz just induced switches and took advantage of the chaos afterwards. I know that this is a Ingles miss, but Jimmer, what are you doing? Here’s his biggest problem: to be in the NBA, he’s going to have to be a role player. But he doesn’t have any role player skills, unfortunately. And quite frankly, if you need just a scorer, you can probably do better: he was 4th in the Chinese Basketball Association this year in scoring, behind luminaries like Pierre Jackson, Darius Adams, and Joe Young. For some reason, far fewer fans seemed to want a Pierre Jackson signing over the summer. I remember when he had a short tryout with the San Antonio Spurs, who saw his offensive talent and thought he might become something, a Bryn Forbes or a Marco Belinelli type. But the word from their camp was that he was so focused on making it in “his way,” namely, as a gunner, that he wasn’t able to fit within the Spurs’ system. Or another example came tonight: when the best player on your team is going for 60 points, and you’re using possessions instead, that doesn’t earn you the relationships you need to find a role moving forward. I appreciated his role in the theater of tonight’s game, and I understand the fans who want to cheer him in what might be his last appearance at Vivint Arena ever. But there are dozens of players not in the NBA who could contribute more.